Liao Wenfeng: How does an average day pan out for you now your in New York? Chen Dongfan: There isn’t anything special. Just work, study and every day life. My rhythm is pretty good at the moment, even if at times I’m pretty idle. There’s never enough time. Liao Wenfeng: The title of your most recent show was Heated Bloom, also the title of one painting included in the show. What were your frame of mind and surroundings when you started work on this piece? 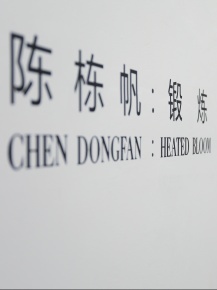 Chen Dongfan: I always wanted to use the word “Duan-lian” (practice / train / temper) — something along the lines of “the state in which metals are tempered”, the iron glowing red hot as its heated and forged. The English title Heated Bloom evokes this state quite aptly. It was my friend Madelena who helped me come up with it. Sounds kind of like the name of some underground rock band. Using the exhibition title “Heated. Bloom” for this painting was a spur of the moment decision; one made when installing the show. Prior to that it was untitled. When I painted it, it was my first time working in a private studio. In contrast to the relaxed feeling of working on the floor or table of a shared studio, the anxiety I felt whilst working on this lasted the whole summer. What I’m referring to here is my state of mind at that time. At first I thought I’d be more relaxed having my living and working spaces separate. If I were to give an example, I’d say the brush strokes you see in this painting are a mirror for my frame of mind at that time. I didn’t allow myself to enjoy the painting process but was rather more careful with not to overdoing things. Liao Wenfeng: This is really a huge piece and you can clearly feel the traces of struggle in it. This and a sense of unfinishedness. It somehow captures time. During the painting process, what barriers did you face? Which were you able to overcome? Chen Dongfan: It’s difficult to say. There’s a kind of distance that’s difficult to straddle here. I spent more time focusing in than on painting really. This was important. Something I wouldn’t have been able to do earlier on. At different stages, I met with all kinds of different obstacles. Whenever one makes there are always problems, ones sometimes one doesn’t have necessarily to find ways of resolving. You lock yourself in it all, and, locked in there, it isn’t really all that bad. For better or worse, by doing so, maybe you find something else. Liao Wenfeng: The figurative elements in this work suggest pale fingers pointing towards somewhere. What are they pointing at? What relationship does this have with the other, small work “Two Stones” shown in the same exhibition? Chen Dongfan: I was pained and confused throughout the making of this work. I was always thinking of a state where mind and body weren’t quite fully in sync and what this would be. For instance, moments when the spirit leaves the body or prepares to come back to it. What would this be? Is this what we experience when we awake? When we die where do we go? Is the mind capable of connecting with such states? Do we even have spirits anyway? Throughout it all, I was trying repeatedly to recall something, a kind of repeated self annihilation. I know such things are useless. Nor is there any answer to it all. I felt even worse then. Then, one day, suddenly I became aware of something. I settled upon it — placed a bouquet at its breast. Expansion and contraction are both natural states. That was the moment I finished making this work. Thanks for noticing that by the way. “Two Stones” is a vow of affection; of life and existence. It’s multifaceted, but at the same time quite simple. It’s all a matter of belief. Liao Wenfeng: Compared to “Heated Bloom”, the “Rag Doll” series seems very relaxed, very everyday, and both series managed to fully occupy separate exhibition spaces. Still, how was it you started that series of works? Chen Dongfan: “Rag Doll” was a series of portraits on news print, it’s subject being abandoned fluffy toys. My initial inspiration was Mark Kelley’s “Ahh... Youth!” The works exude a certain fatalism. In other stages the series begins to relax. There\'s something poppy about it. Something vernacular and easy to assimilate. Liao Wenfeng: How did the many images in “Rag Doll” come to be? Chen Dongfan: All the portraits are improvised sketches. I never had anything for reference. My hands are faster than my head and I just go with the brush. The images just emerge on their own. Liao Wenfeng: The images in “Rag Doll” are all mostly figurative. But at the same time you made these works, you made many others in similar media and of similar dimensions that were abstract. How is it that when painting you gauge the relationship between what\'s abstract and what\'s figurative? Chen Dongfan: When painting portraits, what I’m more interested in is line and shading. This is why there isn’t any real difference between figuration and abstraction. This probably has something to do with the way I paint. I’m not interested in visuals. I don’t don’t care about technique. I’m more concerned with energy. After that, no matter where I get to, I don’t mind. Paintings are growing things. Liao Wenfeng: In the “Rag Doll” series, how did you control the “gaze” each image has? C: I’m not so sure either. It was only in the space I noticed the differences in their “gazes”. When I was painting each one, for me, it was just a matter of focus. Chen Dongfan: For me too, it was only afterwards I discovered the eye symbols; that I became aware of all these “gazes”. “Eyes” are all a “Gaze”. They look toward the inside, the outside, but most come from underneath or from behind. For me, these “gazes” are all my Father’s — And that’s not something easy for me to say. Even though my Father’s already passed, his is a scrutiny that will never leave. Liao Wenfeng: Two years of work and a whole manner of styles hang arrayed together in the two rooms of this exhibition. What’s the relationship connecting it all? Chen Dongfan: For this exhibition, the exterior wall was covered with repeated images of eyes. When did you come upon the idea for this? When you were making it, what were the struggles obstacles you encountered? Chen Dongfan: These works are all traces of time. They all connect with one another. All the painting, the repainting, it’s all been a process of renewing confidence in myself.